While palladium prices soared 6.3 percent this week and in a direction many expected, gold prices dropped 2.0 percent when most participants in market surveys had projected a bullish outlook for the yellow metal before closing up shop last week. Gold’s weekly loss came in large part to a Thursday pounding in which prices fell $31 after the highly anticipated European summit opened with discouragement. By Friday, however, the majority of euro zone leaders agreed on a new deal in an attempt to contain the region’s debt crisis. 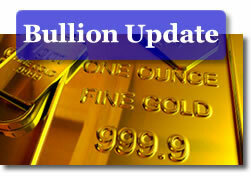 That news lifted equity markets and pressured the U.S. dollar, which heightened support for precious metals. In the week’s closing, gold prices edged up $3.40, or 0.2 percent, to $1,716.80 an ounce in the February futures contract on the Comex in New York. Gold ranged between an intraday low of $1,704.90 and a high at $1,727.90. Trading was thin for much the week, with similar expectations going forward until after the New Year. "The markets are digesting the European news, which has so far been inconclusive. Gold investors are going to be deferring making major decisions…until after the new year," Reuters quoted George Nickas, a commodities trader with broker INTL FCStone. In dollars, gold measured in with a weekly loss of $35.50 after advancing $65.60 last week. Expectations are split for gold prices next week. Two surveys weigh in with different levels of support. In the weekly gold survey conducted by Kitco News, the bias leans toward lower gold prices. "Participants in Kitco News’ weekly gold survey are nearly evenly split on the direction of the market next week, although they have a slight downward bent. In the Kitco News Gold Survey, out of 34 participants, 18 responded this week. Of those, seven participants see prices up, while nine see prices down and two see prices sideways or unchanged. Market participants include bullion dealers, investment banks, futures traders and technical-chart analysts. With the market roughly in the middle of its trading range from the past few months, many traders and analysts were focused largely on the…"
On the flip side, a majority of participants in a Bloomberg survey expect higher prices next week. "Gold traders are more bullish as investors buy metal at the fastest pace in a year to protect their wealth from Europe’s escalating debt crisis. Eighteen of 26 surveyed by Bloomberg expect the metal to advance next week, the highest proportion since Nov. 11. Holdings in exchange-traded products backed by gold rose 108.5 metric tons to a record from the start of October, the most since…"
With gold’s weekly loss added in, the yellow metal trimmed its 2011 gain to $295.40, or 20.8 percent. While all precious metals climbed Friday, palladium was the only one to remain in the black for the week. In fact, owing to supply concerns, the PGM metal has rallied in nine out of ten sessions. Its aforementioned 6.3 percent weekly pick-up translates to a gain of $40.65. Still, palladium is down on the year by $117.00, or 14.6 percent. As for Friday, palladium prices for March delivery rose $11.20, or 1.7 percent, to $686.50 an ounce. Prices ranged between $660.00 and $688.70. Platinum in dollar terms rose more Friday than any other precious metal. Platinum prices for January delivery advanced $21.40, or 1.4 percent, to $1,515.80 an ounce, trading from $1,488.60 to $1,517.90. Platinum’s 2.1 percent weekly fall added to its 2011 losses which total $262.40, or -14.8 percent. Wrapping up the metals action in futures, silver prices for March delivery tacked on 71.5 cents, or 2.3 percent, to $32.253 an ounce. The white metal moved from a low of $31.505 to a high of $32.395. Silver dipped 43.0 cents, or 1.3 percent, this week but has gained $1.316, or 4.3 percent, for the year. Weekly results were mixed. Palladium surged 2.6 percent while other London precious metals registered losses — 2.2 percent for gold, 3.5 percent for silver and 4.0 percent for platinum. Sales of U.S. Mint gold bullion coins rose four of five days this week, with Friday the hold out. In weekly gains, the 22-karat American Gold Eagle added 16,000 after a relatively modest increase of 5,000 during the previous week while the 24-karat American Gold Buffalo surged 8,000, its best weekly performance in at least three months. A scant 500 more are needed to match the coin’s sales total in November. Demand shot higher for the Mint’s American Silver Eagle. Although only climbing on two days this week — Monday and Thursday, sales of the .999 fine Silver Eagle leapt 906,000. That was the best weekly performance since the week ended September 23. *The United States Mint does not provide daily sales figures for its 5-ounce silver coins. The sales are current as of Monday, December 5, 2011. How about some e-features on the classics of numismatics, e.g.key coins of obsolete series?